This article is based on a lecture given to the Meath archaeological and historical society by Martin Dire at the Fourknocks in June 2004. The lecture was based on outlining the less obvious reasons why structures like the Fourknocks were sited where they were. Martin argues that the placements of the prehistoric monuments are far from haphazard or random. The right brain deals mainly with artistic expression, aesthetics, poetry, imagination and recognising patterns in the whole. Paradoxically we only ever use just under 10% of the brain and in today’s society we are left brain biased. In other words we interact with our world from an “I must do, enter, translate, earn, build, conquer, fix” perspective. Our culture and aesthetic values reflect this. However, the Japanese are predominantly right brained and just a cursory glance at their culture would show that they are concerned with buildings that look inherently beautiful and in harmony with the landscape. There is another more ancient culture that is very right brained in its approach, even the language is poetical as a result. That race is the Irish. An example of how our language reveals our brain bias is illustrated by how in english we may say “she is pregnant”….a sterile dispassionate description. However, on the west coast of Ireland, describing the same event, we may hear, “ tá sí ag eirí eneas” – she is rising in the east, following the path of the sun…evocative, poetical. Aesthetically we find ancient structures beautiful; Greek temples, Pyramids, Newgrange art work etc . Amazingly all these structures have what we now call sacred geometry used in their construct. It is based on naturally derived harmonious proportions, something akin to our musical scale. Compare this to something like the Ballymun tower blocks which do not contain sacred geometry. I mention this mind set as it is obvious that the stone age people who built places like the Fourknocks were operating from a more right brained perspective on life, thus to appreciate the work we should alter our perceptions and attempt to see as they saw. The following headings examine the different ways of interpreting the same site. Archaeology can tell us factual information about the site and is very left brained in its approach and tends to leave the humanity and mystery of the site as a non entity, essentially ignoring what motivated the builders in the first place. The Fourknocks is a ridge running east-west near the village of The Naul. The site consists of three main cairns set within a landscape of ritual. The site was excavated in the 1950s by PJ Hartnett. He discovered that the Fourknocks II which is in a field to the immediate east of the main mound, (Fourknocks I), had several phases of development. The early phases consisted of a crematorium pit and passage grave. Around this time a small cairn was constructed that covered a token burial. 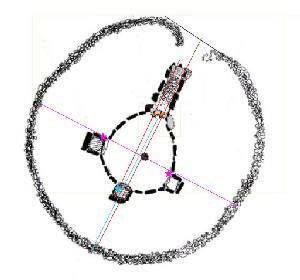 Then at a later phase of activity the cairn was enlarged to encompass the earlier passage grave and crematorium pit. It was made to look similar to its sister mound in the next field. Fourknocks I had a post hole in the centre of the chamber. It is thought that this may have supported a wooden roof, although no roofing material was found. I think that a wooden post is unlikely to have supported a roof as suggested, as wood rots and over time a new post hole would be required to support the roof. There was no evidence of any recut, thus suggesting that the chamber may never have been roofed and that the post hole may predate the construction of the mound and was the principal marker on the site. 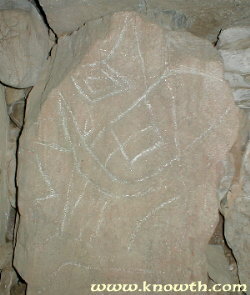 It may also leave open the possibility that the central post was in fact a standing stone similar to the Lia Fáil at Tara and may have been removed or destroyed in antiquity. Fourknocks I had about 65 burials, a mixture of inhumations, and cremations, and a mixture of adults and children. However, the burials were confined to the recesses and passage, reserving the central chamber. Pottery fragments, flint and antler were also found on this site. Astronomy, the study of the movement of the stars and planets seems to have been a well developed science in the stone age when the chambers of the great mounds were constructed. We know that on the shortest day of the year the sun illuminates the chamber of Newgrange at sunrise and Dowth at sunset, although this isn’t accepted by the “experts”. 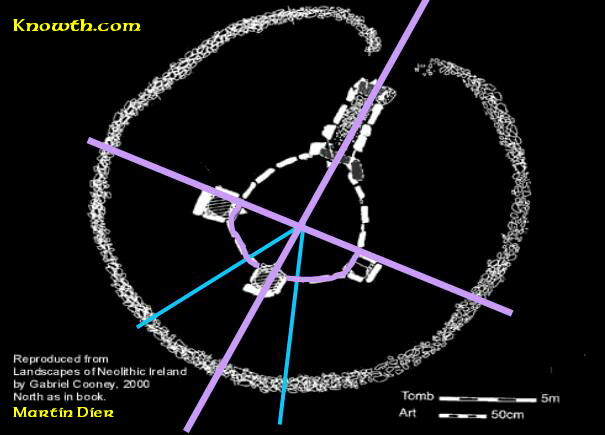 However, Newgrange has many other astronomical alignments. 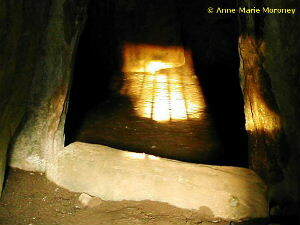 The Moon also illuminates the chamber at Newgrange. Something that only recently archaeologists have considered. This wonderful photograph by Alan Betson was printed on the front page of The Irish Times newspaper on the 22nd December 2003. 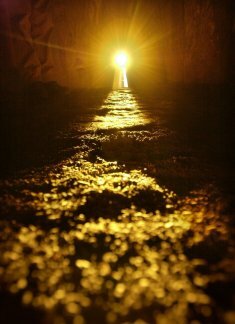 Sunlight streams into the chamber of Dowth south around the winter solstice at sun set (photographed on January 11th 2003 by Anne-Marie Moroney). Since 1997 when Anne-Marie Moroney began observing winter sunsets at Dowth, evergreen trees to the west of the mound have been blocking more of the sunlight each year. According to some “authorities” on the Boyne valley this event does not happen. Let us look at some of the mythological and other more obvious evidence that may point to the astronomical alignments at Newgrange. The mound is surrounded around the south-eastern face by white quartzite (a stone with strong connections to the moon). Seen in plan this looks like the shape of the crescent moon! It’s also the side of the mound that faces the direction of the rising crescent moon. The Irish name for Newgrange, Brú na Bóinne, means the fairy mansion of the Boyne. But the word brú also has connotations with the tuath de danann (lords of light who enter the chamber today as the solstice sunbeam) and with the womb. The womb correlating with the female reproductive cycle, which as we know correlates with the phases of the moon. According to Brennan, Fourknocks I is aligned 17° east of North, which just eliminates any of the direct lunar or solar alignments with the passage (but not the chamber). However, during the stone age the passage was aligned with the helical rising of the “W” shaped constellation of Cassiopeia. This constellation is curious in that during the stone age it would rise above the horizon after sunset, but now because of the procession of the equinoxes the star no longer rises and is observed in the sky all year. Perhaps their science allowed them to single out this constellation during the only time in its 26 thousand year cycle it rises and sets. It is interesting that most of the art in the Fourknocks is dominated by the W shaped zig zag. However, this alignment may largely have been symbolical rather than practical as the passage was filled by burials during the stone age hence closing off the chamber. The Chamber of the “mound of the hostages” was also filled by burials from the bronze age, but its stone age function of aligning to the Samhain sun rise is still observable today. The sunrise is most accurate for about a week around Samhain, and interestingly one of the great feasts associated with Tara was the Samhain week long celebration. Samhain Sunrise illuminates the back of the Mound of the Hostages - Hill of Tara 1992. Further intriguing about the placement of the monuments is their alignments with each other and with significant landscape features. Fourknocks I is on the same bearing as the winter solstice sunrise as seen from Newgrange. 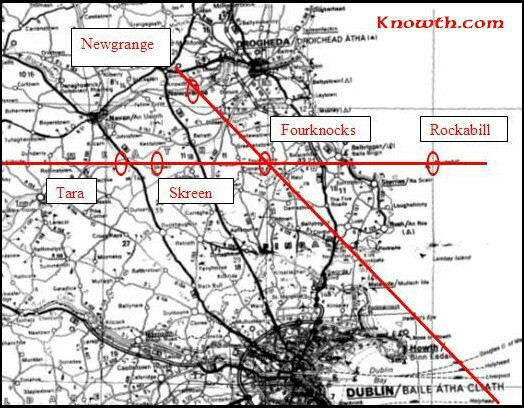 In other words if you could travel down the passage at Newgrange and out the roof box on winter solstice and follow the sun you would end up crossing the kerbstone K1, standing stone GC1, mound A, red mountain and arrive at Fourknocks I, although the mounds are 10 miles apart and are not intervisible. Fourknocks lies on another significant equinox sunrise bearing, as on this morning the sun rises over Rockabill, and over the mound of the Fourknocks II, Fourknocks I and continues through the hill of Skreen and through the hill of Tara! Although the passage precludes a full solar or lunar alignment the genome (central post/stone) and the tops of the chamber stones could act as solar and lunar markers. It is uncertain if the chamber ever had a roof of wood or cattle hide but if it did it would have been an easy task to have opened portals to allow the sun in to illuminate the stones on certain dates. Even without a roof the sun could have acted with the central post/stone to cast shadow alignments. Geomancy is the study of the more subtle forces in nature such as energy ley lines, underground water etc. At the Fourknocks I there seems to be a spring over which a pole or stone was erected in the stone age. Although the spring does not reach the ground surface it does exude two underground streams which flow from the centre of the chamber in a south easterly and a south westerly direction. (marked blue in diagram) The North-south energy line seems to connect with the hill peaks of the south of the chamber and is very close to the alignment of the rising of Cassiopeia. The east-west energy line seems to be more sinuous and seems to meander slightly like a river might. And finally between the recesses inside the stones flows another current (all energy lines are marked in purple). The energies may be accessed by anyone with sensitivity and feels like a tingle in the hands and fingers. Alternately a dowsing rod may be used to divine their presence. The geomantic aspect is a very right brained approach to interpreting the site but it would be highly significant to the use of the site in regard to ceremony and spiritual/religious beliefs. Photographic reconstruction of Fourknocks II to the right of Fourknocks I (original image of Fourknocks I from an article by Gabriel Cooney in Archaeology Ireland, Summer 1997). Fourknocks III is to the immediate right of where the photograph was taken. 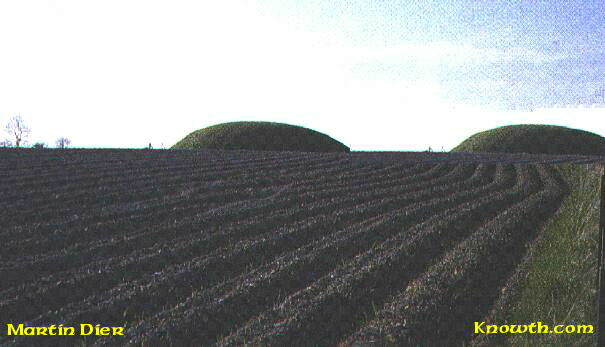 This idea of similarity of the mounds may have had some sort of ritual or spiritual significance. There seems to be very close relationship between both mounds. On an energetic level this could be seen as a yin and yang site, opposites of the same whole. Take for instance the art representing this notion and compare it with the oriental symbol of Yin-Yang, note the similarity of paired opposites. Take for instance the art representing this notion and compare it with the oriental symbol of Yin-Yang, note the similarity of paired opposites. Consider also that the Fourknocks II was the centre of “doing” or preparing the bodies through cremation and/or defleshing. The human remains that were treated as individuals during the cremation were buried communally in the other mound, the centre of “being”. Note also that the Fourknocks I passage had originally no roof , where as the Fourknocks II had an original stone slab roof. The centre of Fourknocks II was essentially filled with cairn material and so was private, where as the Fourknocks I had an open courtyard and is thus more public or theatrically orientated. 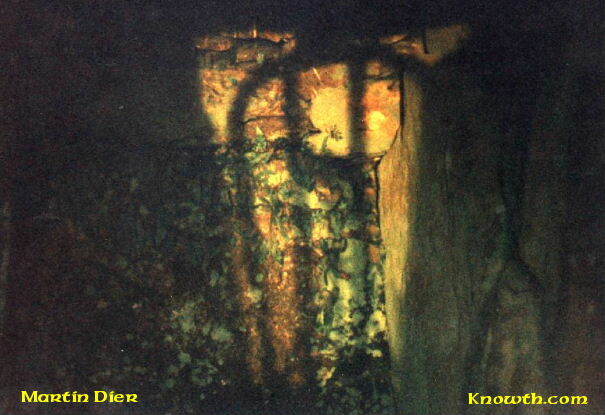 Fourknocks II is on higher ground, its companion on lower ground. This continues through to today as we plainly see that Fourknocks I is open and public where as its companion is secretive, on private property and hidden. This list of pairing opposites is far from exhaustive but also includes important twins such as sky/earth, east/west, adult/child, sunrise/sunset, death/rebirth, individual/collective etc. Another consideration on the art work of Fourknocks and other passage graves may be linked with shifts in consciousness. This may be naturally induced through meditation, chant, drumbeat etc or through the use of hallucinogenic plants such as magic mushrooms (which were growing in pre-historic Ireland.) One interesting observation of people who go into altered states is that many report regular geometric patterns flashing before their eyes. 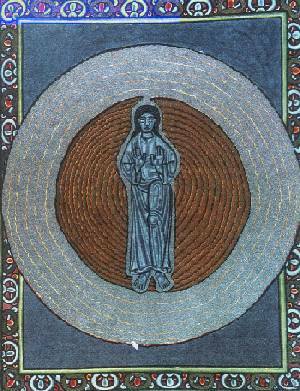 One of the most noted sage/artists to include this in her work was St. Hildegard von Bingen who would come out of religious ecstasies with fully formed songs and psychedelic art (Note the series of repetitive geometric shapes around the figure). People who experience the visual phospine distortions during a migraine attack also experience something similar. Professor Alexander Thom was the first person in recent history to suggest that the Neolithic peoples had a precise measuring system that was used throughout Britain and France. More recent research by Martin Brennan strongly suggests that Ireland too had the very same units of measure. These units are similar to inches, yards and miles. They can be found in the placement and art of Newgrange, Knowth, Dowth and Loughcrew. The units of measure are based on natural harmonious proportions that seem to underpin the mapping of everything from ice crystals, sunflower seed heads, musical scales, body proportions and of course art and architecture throughout the Neolithic. “but the offsets stood apart….the offset was the key….they were simply and obviously what they appeared to be; a segmented line divided into parts that gave measurements, a ruler giving the Boyne valley canon of measurements…. I measured the first calibration. It was 2.6cm or slightly over an inch. The next measurement was slightly larger than 3.6cm…..I labelled the first measurement A, and the second measurement B…..I went to the drawing board. The natural thing to do first was to create a square with my linear measurement A. I drew the diagonal of the square and measured it. The diagonal was a B. This established the geometrical relationship of A to B as 1: 1.414 or 1: √2 . This is the relationship of the Egyptian royal cubit to the remen….” Martin Brennan, Boyne Valley Vision. 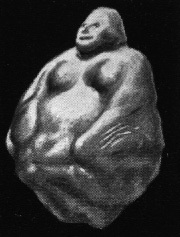 Brennan quickly discovered other proportions such as the golden section and the vesica pisces ( proportions that constantly reappear in nature and thus termed Sacred geometry) in the art work of stone age man in Ireland. It is more useful to see sacred geometry as fractions, relationships or proportions rather than decimal numbers. But the decimal form of the relationship best demonstrates the irrational quality of the numbers. 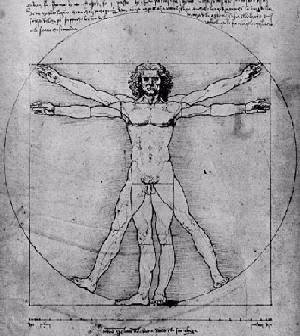 Leonardo da Vinci depicted a man with arms and legs outstretched touching the perimeter of a square and a circle. Leonardo incorperated sacred geometry into all of his major works. The proportion of the perimeter of the square to the circle are in harmonious proportion and this proportion is found in the human figure and in such diverse places as the spiral formation of galaxies. In his painting of the last supper the figure of Jesus is placed in respect of the golden section. 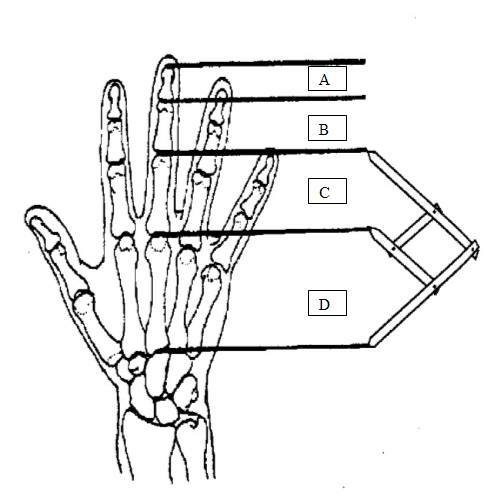 I have included a diagram of the hand to demonstrate the various relationships. The relationships continue in the same format to include hand to arm (cubit). 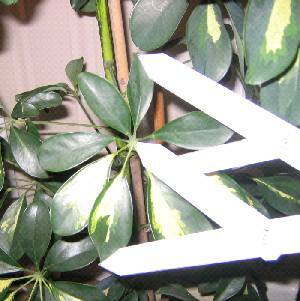 It is also shown in the leaf pattern of a house plant in the picture below. It is worth emphasising that there is a feeling of an intuitive “rightness” when these proportions are incorporated into art and architecture. When the phicallipers (a simple device built using the symmetry of the pentagram) measures the distance between leaf tips the leaflets are clearly proportioned by the golden section. Having a look then at Fourknocks art and architecture it is obvious that these proportions not only exist but were deliberately incorporated into the construction and decoration of the site. Taking a representative sample of art work from the Fourknocks I it can be seen how the art incorporates the Φ relationships, thus demonstrating at the very least that measurements of length and breath were taken into account and the designs were executed according to a plan rather than being random. It indicates that some sort of underlying organized grid system was in use that could be expanded to be used on a larger scale such as in the design of the cairn and most likely in the placement of the cairns in relation to one another. Taking the length from the first entrance orthostat to the furthest orthostat in the end recess the golden section divides the passage from the chamber. If we further extend this line in both directions to the point of the enclosing kerb again the point of golden section divides the passage from the chamber. Key positions for the other side recesses fall on points of the golden mean. When a line from east to west kerb is bisected at the golden mean by the corner of the most northerly recess stones! 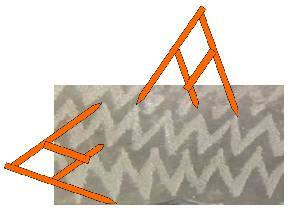 The Centre of the North recess is pinpointed by the golden section on a line drawn from the passage/chamber boundary to the most northerly part of the kerb. There are many other correlations within the geometry of the mound based on circles with radius equal to that of the passage. These interact with each other and with phi to build up a complex hidden underlying geometry. Mid-Atlantic Geomancy is an excellent Sacred Geometry resource. It can be appreciated how different views of the same site add to the more wholistic view of what the site means. The view-points presented are far from exhaustive, but should broaden perspectives on the site and how it is linked to the landscape physically, symbolically and etherically.